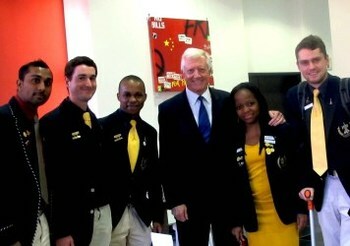 Five student leaders from the University of Pretoria recently had the privilege to spend time with famous businessman, leader and author, Brand Pretorius. Mr Pretorius has held numerous prominent leadership positions, including that of Managing Director and CEO of Toyota South Africa and the McCarthy group. His leadership is widely seen as having been instrumental in past success of both of these groups. He continues as a board member for various prominent businesses and was appointed a fellow of the University’s Gordon Institute of Business Science (Gibs) in 2007. He is also the author of the recently launched leadership book In the driving seat. His interaction with the students on the Gibs Campus formed part of the Student Leadership Development Programme run in partnership with the Albert Luthuli Centre for Responsible Leadership, TuksRES, Student Affairs and Boekenhout Residence. He met with Marco Koch, Erwyn Durman, Zamantungwa Khumalo, Claudio Volpato and Sibusiso Sibanyoni, all leaders in Boekenhout, Taaibos and Klaradyn residences on campus. Apart from their residences they have also been involved in broader leadership initiatives and will be transmitting the messages from their experience to other leadership circles on campus. Mr Pretorius centered the discussion around leaders he respects. These include people who are proud and who can inspire, who have a positive vision, who are not afraid of the future, who can make plans and be innovative, people who can embrace change and be adaptable. He explained that he finds these people in all walks in live, from President Mandela whom he reveres, to Mr Zulu who worked for McCarthy washing cars who inspired him through his proud approach to everything he did and in how he handled people.